Hello crafting friends. Lena here today to share a card with you that I made for a dear friend's wedding anniversary. It's a very romantic easel card. It measures approx. 5" x 5" and it folds flat for mailing. 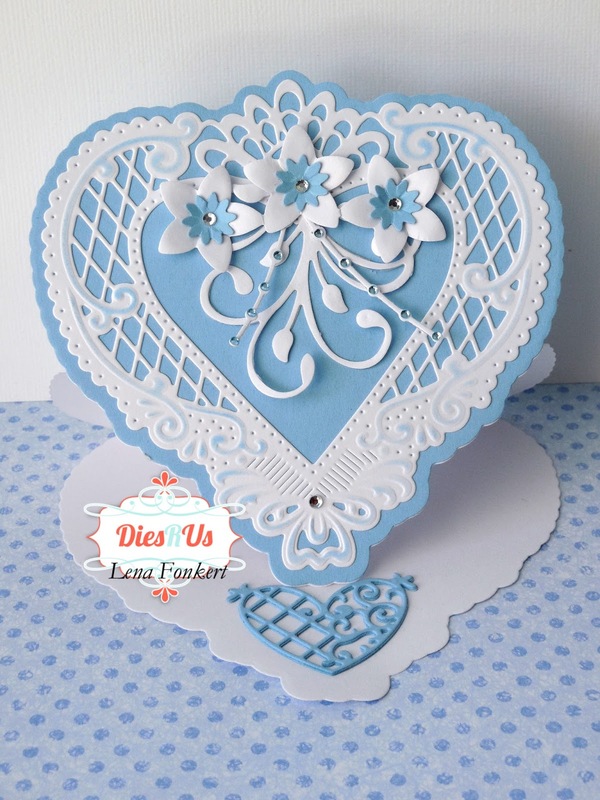 I began making my card by cutting out the base in white card stock I used a Marianne Designs die called Anja's Filigree Heart. I folded a piece of card stock in half and laid the heart die a little off of the top so that the heart would not cut all the way through. You can do this with any die you have in order to make it a shaped card. 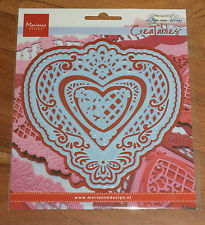 Next, I used the same die and cut out a full shape from blue card stock to use as the background for my filigree heart. 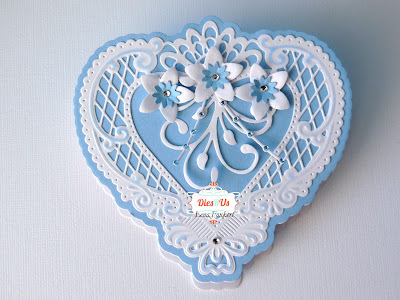 I cut and embossed the filigree part of the heart. While the card stock was still in the die, I used a sponge dauber to lightly ink all the embossed areas. I used Memento Summer Sky ink to do this. 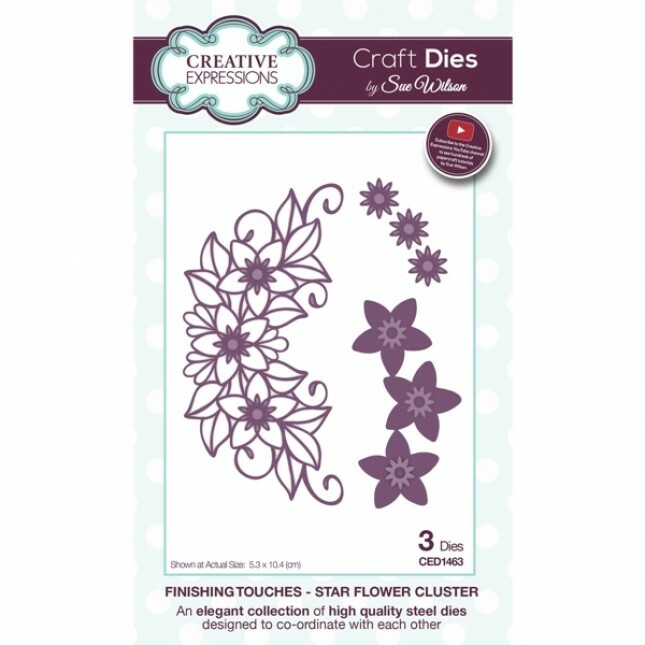 Next I cut the flowers from the Star Flower Cluster die by Sue Wilson. Using a medium ball tool, I shaped the flowers to give them a little dimension. Once this was done I adhered them together and added a little blue gem to the center of each flower. I needed a little foliage for my floral arrangement, so I cut out some and branches from the Flourishes and Branches die by Elizabeth Craft and also a sprig from the Spellbinders' Sprigs dies. I put it all together into a small arrangement and added some more gems to the little branches. For the inside of my card, I cut the little heart die 5 times and adhered it to each other, to make it thicker so that it will hold the front of the card when it's opened. 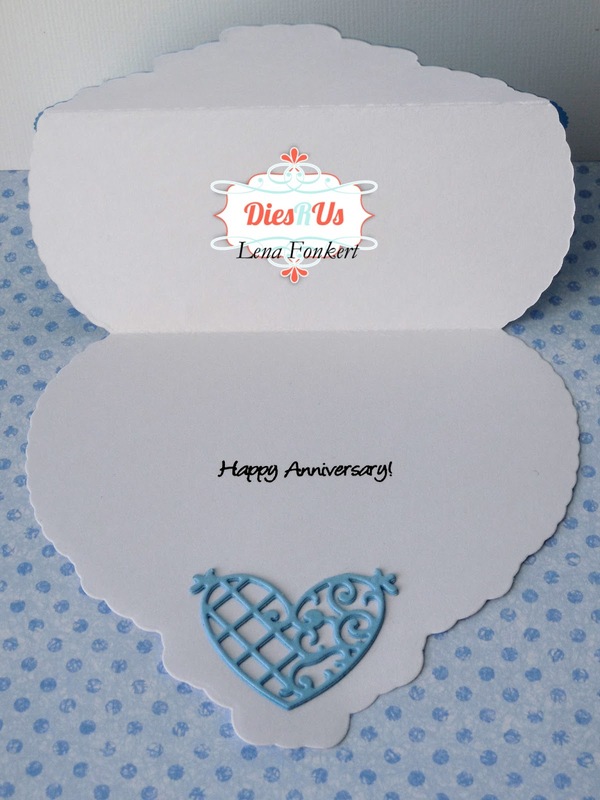 Lastly, I stamped the Happy Anniversary greeting. Every so often, Dies R Us runs a big sale on international dies. 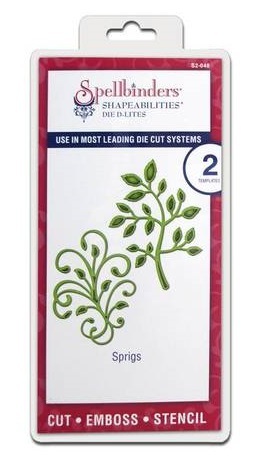 During these times, you will find dies from companies such as Marianne Designs, Lea'bilities, and Joy Crafts amongst others. The best way to know about these fabulous sales is to subscribe to the Dies R Us Newsletter. If you scroll down to the bottom of the page, you will be able to enter your email address and be put on their mailing list. A very special card and a clever idea. I think that Christi has a good idea and I am going to put some of these dies on my wish list too. Beautiful creation Lena! Thanks for all the wonderful tips & tricks! Awesome inspiration ... well done! Lovely card with the blue and white and the lattice from the heart die. You've created a wonderful design with the flowers in the center. So creative using the SB Sprigs as a flourish in the middle. This is so beautiful! Lena this is so stunning! Love the shaped card the dies made. Great job embellishing that lovely heart! I have never done an easel card, this one is just perfect! great job!